Academic Team is comprised of students who wish to compete in Academic Bowl competitions. We have a Varsity Team comprised of 10-12th grade students and a JV Team comprised of 9th grade students. 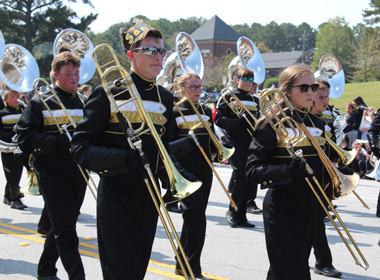 We attend approximately five competitions during the year, primarily after school on Mondays. See Mr. Harvey in Room A218 to join! Our students never stop reaching for it. Whether it's in the classroom or on the stage our students go for Gold in every performance and competition. "Contrary to popular belief, Art at its best or most prestigious has more to do with an individual’s Attitude than their aptitude. It has more to do with their Awareness than attention to detail. without an Attitude of respect for those blank spaces that artists are driven to fill, without an Awareness of, for example, what color or how much color, Art becomes purely representational, lacking emotion, lacking a life all its own. The CHS Trojan Band— Celebrating Over 67 Years of Excellence. The Carrollton High School Debate Team captured its 10th state championship in 2018, maintaining its impressive place in CHS history as the second-highest number of state titles claimed by any program – academic or athletic – with the exception of the state crown leader, boys track. A debater researches and prepares on several different topic during the academic year. For the state tournament in 2018, teams find out the topic two weeks before the competition. This year's state competition featured "Resolved: The United States ought to provide a universal basic income." The preparation and work that goes into preparing for this tournament is an all-out team effort with research, argument development and a lot of practice, practice, practice. The reward for that hard work is the debaters opportunity to participate in prestigious tournaments such as Columbia University, Sanford, Harvard , Emory University, and numerous regional a national tournaments. The team has been crowned state champion 10 times – in 1987, 1988, 1989, 1992, 1995, 1996, 1998, 2003, 2010 and 2018. The team was the state runner-up champion seven times – in 1986, 1990, 1991, 2000, 2001, 2002 and 2004. The team also has captured 17 region titles. In 2010, the Georgia High School Association discontinued the debate championships, picked up then by the Georgia Forensic Coaches Association. CHS won state that first year. The Bass Fishing Club is open to students who love the sport of fishing and enjoy the outdoors. See Coach Cleek in Room A221 if interested. Beta club is a national service organization. The club goal is to foster positive citizenship through service, including helping with football game concession setup, participating in the First Baptist Fall Festival, and sponsoring a family at Christmas. 9th grade members must have been a member of Junior Beta Club; 10-12th grade members must have at least a 3.0 GPA. Students may complete a membership application and pay dues until the end of September. Members of the Book Club read and discuss books, complete community service activities, and watch films inspired by various texts. Students complete an application form and attend at least one meeting per month or donate a book to the book collection. Chess Club is a club in which students get the opportunity to hone or develop their skills in a game of Chess. One of the main goals of Chess Club is to provide a welcoming environment for all students so that nobody, regardless of skill, will feel left out. Our focus on acceptance of individuals-- regardless of any external factors-- makes us a club that both helps us grow as players and as people. The Computer Science club is dedicated to bringing awareness of computer science to our students and community. We will participate in various competitions including hackathons and eSports tournaments. Environmental Club is open to anyone interested. We focus on promoting recycling and exploring our beautiful earth by hiking. See Mrs. Sewell in Room B003 if interested. The mission of FCA is to present to coaches and athletes and all whom they influence the challenge and adventure of receiving Jesus Christ as Savior and Lord, serving Him in their relationships and in the fellowship of the church. We participate in Friday morning “huddles” for fellowship and worship. Film Club meets on Wednesday afternoons 1-2 times per month to watch and discuss important, historical, and critically acclaimed films. Through participation in First Priority, students will study and apply God’s word every Wednesday after school. French Club is open to anyone interested in exploring various aspects of the French culture as well as other French-speaking countries through food, music, film, and art. Dues are $5 and meetings will generally be every 3rd Tuesday of the month. French Honor Society members will further explore the culture and language of France and French-speaking countries as well as participate in various service projects. Students must have at least a 90 overall GPA and received a 90 or above in both French 1 and by midterm of French 2 to receive an invitation to join. The mission of Friends of Rachel is to provide kindness, acceptance, and support to all students. This is an equality club that reaches out to and welcomes all individuals. Members must have a kind heart and a willingness to help and support anyone. FEA encourages students who are interested in pusuing careers in the field of education. The mission of FBLA is to bring business and education together. Club members participate in school and community projects and learn business skills during monthly meetings. Students must agree to participate in fall Chic-Fil-A calendar sales and Spring AYP card sales. HOSA Future Health Professionals is a student organization whose mission is to promote career opportunities in health care and to enhance the delivery of quality healthcare to all people. HOSA members enjoy hosting blood drives for the American Red Cross, raising funds for Tanner Hospice Care and the HOSA National Service Project, and participating in many other community service projects. HOSA members also participate in state and international healthcare competitions. HOSA membership offers multiple scholarship opportunities as well as growth in teamwork and leadership skills. Horticultural Club is open to anyone interested in exploring growing plants from inside to outside. We will utilize Mr. Hawig’s classroom to plan, prep and transplant our creations to either indoor spaces or eventual outdoor areas. Goals include learning about our autotroph friends, plants! At every meeting there will be general care and maintenance of plants with special projects started and ongoing. We will generally meet once a week. Interact is an international student service organization related to Rotary International. The club completes several service club projects during the year, linking with the local Rotary Club for community service/outreach. Members must maintain at least a 3.0 GPA, demonstrate regular attendance at meetings, and participate in major club projects. Application is required at the beginning of the school year. See Mr. McCormick in Room A122. Carrollton High School Performing Arts Troupe 3682 would love to add you to our roster of members! The Thespian troupe is an exciting component of our school’s performing arts program. Not only a resume builder, your ITS membership offers many valuable benefits, services, and opportunities to our Thespians throughout the year. We are especially excited about attending the Georgia Thespian Conference each February. For more information about the International Thespian Society, you may like to visit their website at www.schooltheatre.org. For information about our troupe, see Mr. Cox or one of the officers. Key Club is an international student service organization related to Kiwanis International. The club completes several service club projects during the year, linking with the local Kiwanis clubs for community service/outreach. Members must maintain at least a 3.0 GPA, demonstrate regular attendance at meetings, and participate in major club projects. application is required at the beginning of the school year. The Math Team is designed for students who enjoy mathematics and are interested in participating in mathematics competitions. We meet bi-monthly to work on competition-style practice problems and various contests. See Dr. Rader in Room A114 if interested. of the Trojan Head decorations for the Homecoming Parade/Court and Sweethearts. Lastly, each year members are given the opportunity to travel to the High Museum on a date that corresponds with a SCAD Day for an all day Visual Arts’ experience involving fine art and fine art education at its best. We continue to look for new and creative ways to meet the needs of our ever-changing student members. NHS is a general academic honor society that focuses on leadership and community services. Students are invited to join NHS during their sophomore or junior year, if they maintain an average of 90 or above. Applications are distributed with an invitation in February of each year. Members of NSHS will enhance their interest in the pursuit and acquisition of the Spanish language and knowledge of the Spanish culture. Students must have an average of a 90 or above after the first semester of Spanish III in order to receive an invitation to join. NIKE club is open to all junior and senior girls who complete an application in August. The club objective is to serve women, children, and community. Service projects include creation/distribution of monthly Secret Teacher gifts, and volunteering with Angel Tree, Manna House, the Carroll County Soup Kitchen, and Trojan Old to Trojan Gold. Through participation in the Outdoors Club, students will learn how to be safe while enjoying various outdoor activities, including group hikes in local parks and nature preserves. ROV works to design and build a vehicle that moves underwater to perform specific tasks designed and described by MATE. This club is open to all students who have a GPA of 3.0 or higher and are interested in engineering and/or programming. Serteen is an extension of our local Sertoma Club. Sertoma is a worldwide club dedicated to serving mankind through service projects and fundraising. CHS Serteen Club participates in numerous service projects in our school and community throughout the year. Some of our largest events include volunteering at the 4th grade Drug Rally and the Special Olympic track meet in the Spring. Everyone is welcome to join Serteen! To sign up, you must attend a meeting in August. One of the musical ambassadors of CHS, this ensemble benefits our students by providing an extracurricular musical opportunity. Rehearsals are every Tuesday evening from 6:00-8:00 pm. Show Choir has performed at Six Flags Over Georgia, the Trinka Davis Veterans Center, numerous assisted living facilities, Sunset Hills Country Club, The Kiwanis, Rotary Dawnbreakers, Tabernacle Baptist Church, First Baptist Church, Mecca Fest, during our annual Singing Valentine’s fundraiser, for Carrollton’s Lit Mu chapter and Tanner Medical center just to name a few. To book, please call the performing arts department at 770-834-2116. This is a Co-Curricular organization for Broadcast Video, Engineering Drawing & Design, and Graphic Communications. Students are able to develop leadership skills and compete in Region, State, and National competitions. Members must be, or have been, a student in one of the relevant program areas. See an advisor for an application if interested. Members of S.I.S.T.E.R.S are young ladies seeking intelligent solutions to everyday situations. Members receive mentoring in a wide variety of areas, including making wise decisions regarding appearance, life choices, and post-secondary school. Girls must have at least a 2.7 GPA and fill out an application. Spanish club is open to anyone who has an interest in the Spanish language and Spanish/Latin American culture. We will engage in various activities that help us learn about this fun language and culture relevant program areas. The goals of student council are to: foster communication among students, administrators, staff, and the community; promote, organize, and execute activities that encourage student pride and school spirit; install democratic ideals; provide an outlet for student expression; and provide a forum for aiding in the solution of school problems. Student council members are elected each year by the members of their graduating class and must uphold a strict set of expectations. Interested students must attend an informational meeting and then run a campaign. TSA fosters personal growth, leadership, and opportunities in Science, Technology, Engineering, and Mathematics (STEM); members apply and integrate these concepts through co-curricular activities, competitions, and related programs. *Students should see Mrs. Austin in the STEM Room for an application. The Trojan Trebles is an all female, auditioned acapella group. We feature pop and jazz repertoire with close harmonies for soprano and alto voices.The Trebles perform at many community events and private functions such as the Carrollton Arts Festival, The Strides for Sheri 5k and Toys for Tots. This group is perfect for gatherings of any occasion. Please contact CHS Performing Arts at 770-834-2116 to book. Yearbook is the class, listed as Journalism 1 and 2, that produces Carrollton High’s outstanding annual. Students muts be at least a Sophomore and need to be prepared to meet both semesters of the school year.